Why do "they" bother to suppress gold? Where do "they" get the money to prop up stocks without it being noticed? Believers in manipulation always try to answer them separately, and these answers never seem to fully satisfy critics. Surprisingly, in all the conspiracy articles I have ever read, I have never heard anyone suggest that the answers to these two questions is directly linked. Unnatural (PPT) rallies in stocks always seem to coincide with strange activity in the gold market. Rather than try to explain, have a look at the graphs below. I have highlighted three PPT (Plunge Protection Team) interventions in the stock/gold markets following the Bear Sterns collapse, the Indy Mac Collapse, and the Lehman bankruptcy. Looking at these two charts side by side, it should be obvious what is happening: the treasury/ESF funds its stock market interventions by shorting gold! 1) One of the not-discussed motives to selling/shorting gold is to raise funds for other interventions. In fact, on some occasions, raising money to save the stock market might be the main motivation for shorting gold. 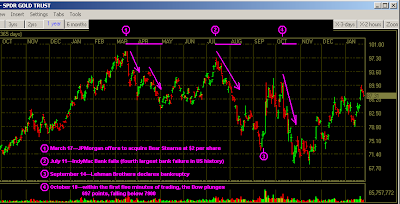 This entry was posted in Background_Info, Federal_Reserve, Gold, Treasury, Wall_Street_Meltdown. Bookmark the permalink. Now that I think about it, to further test your point, you could correlate the price of gold with the different heads of the Fed and see if the correlation is better or worse than with changes at the head of the treasury. Eric, are you still thinking the dollar collapse will happen within the next 5 months or so? I don't seem like a none believer, but how can the fed be saying that things are looking up, the bottom has come, and we will see growth by the end of the year? Anyways, do you still believe the dollar will collapse this year? As long as there is some bullion around to pretend that the futures are covered with metal and few take actual possession of their barbarous relic the system works. By removing an inflation indicator (and rig the CPI) it helps to keep interest rates low what further benefits stocks. Think which investment classes move in the longer run together and which move inversely. Looks like those who intervene know how to do it. 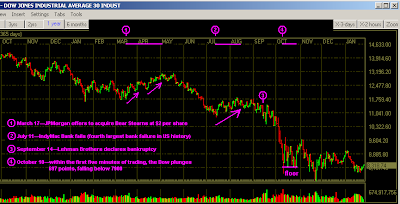 Any theories as to what happened in the big markets (USD,Gold,Oil,Stocks) on July 14, 2008? On 7/14/08, all markets did a coordinated 180 turn on their previous trends, leading straight into the financial collapse in Sept/Oct. I'm surprised your thorough research on market manipulation has not pinpointed this specific day as very, very important. Of course - this is not taking in the price of oil / value of the US Dollar. Both causing variable effects on the market. Suppressing gold, pushes the dollar up and oil down... a win win for the feds.